Combine all ingredients together in a medium bowl and mix thoroughly. 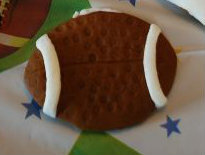 Form dough into ten 1½” balls and then mold into football shapes and place on an ungreased cookie sheet. Bake for 14-16 minutes. Cool on a cooling rack and enjoy. 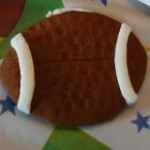 If you really want to get fancy, add the laces with LC-Vanilla Frosting mix!